The GCC Ski Club is skiing on Monday nights this season. We will travel as a group to Holiday Valley on Mondays starting in the Spring semester. Our season passes cost $135 (if ordered by November 1st), include 8 free lessons, and are valid beginning in December. Many local students find opportunities to use their passes over the winter break. It is going to be a cold winter…. Make the best of it, and hope to see you on the slopes! This free workshop will provide helpful hints for every step in the job seeking process, from writing a resume, to preparing for the interview. Feel free to bring your resume and questions. This is a fun and interactive workshop! YOU WERE ALL WAITING FOR IT…..
**GCC Cougarettes Dance Team welcomes donations for the upcoming FALL Rummage Sale. We are accepting donations in C209 , please feel free to drop off any items you care to donate!! Proceeds will benefit GCC Cougarettes Dance Team!! Stop down, remember one person’s trash is another person’s treasure!!! Genesee Community College’s 2015 Annual Security & Fire Safety reports are now available. This report is required by the Jeanne Clery Disclosure of Campus Security Policy and Campus Crime Statistics Act and contains Clery Act reportable statistics for the calendar years 2012, 2013, and 2014 concerning reported crimes that occurred on all Genesee Community College campuses, College Village, and on public property within, or immediately adjacent to and accessible from all GCC campuses. This report also contains institutional policies and procedures concerning campus security and safety, such as those concerning alcohol and drug use, crime prevention, the reporting of crimes, fire safety, emergency response, and several other safety and security related matters. Charles will talk about “Opening Minds and Closing Gaps,” as he explores Truths, Trends and Traps. 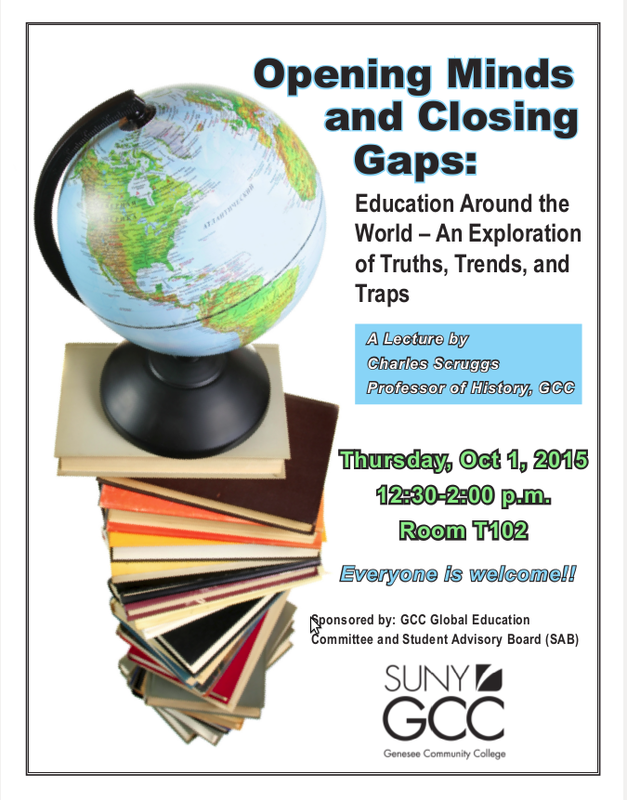 We hope to see you on Thursday, October 1, 12:30 – 2:00 in Room T102. Dean of Human Communications and Behavior Genesee Community College One College Rd. Can you say Thurple? Thurple what?? Purple is the signature color for Domestic Violence Awareness Month in October. Please show your support for this campaign against domestic violence by wearing PURPLE on THURSDAYS during the month of October – sport your purple socks, purple shirts, purple shoes, purple ties, purple jewelry, anything purple! We will be joining our SUNY partners and turning our campus PURPLE for our annual SHINE THE LIGHT campaign on Wednesday, October 21st (more exciting details to come…)!! !